Promoting energy efficiency (EE) has become a leading policy response to greenhouse gas emissions, energy dependence, and the cost of new generators and transmission lines. Such policies present numerous puzzles. Electricity prices below marginal production costs could warrant EE policies if EE and energy are substitutes, but they will not be substitutes if the energy price is sufficiently high. Using EE savings to meet renewable energy requirements can dramatically increase the marginal cost of electricity. Rejecting "rationality" of consumer energy choices raises doubts regarding cost-benefit analysis when demand curves may not reveal willingness to pay. Decoupling to guarantee constant profit regardless of use contradicts findings that incentive-based mechanisms outperform cost-ofservice regulation. Regulators may implement EE policies to exercise buyer-side market power against generators, increasing consumer welfare but reducing overall economic performance. Encouraging utilities to take over potentially competitive EE contradicts policies to separate competitive from monopoly enterprises. Using data on 61 oil companies from 2001-09, we examine the evolution of revenue efficiency of National Oil Companies (NOCs) and shareholder-owned oil companies (SOCs). We find that NOCs generally are less efficient than SOCs, but their efficiency increased faster over the last decade. We also find evidence that partial privatizations increase operational efficiency, and (weaker) evidence that mergers and acquisitions during the decade tended to increase the efficiency of the merging firms. Finally, we find evidence that much of the inefficiency of NOCs is consistent with the hypothesis that government ownership leads to different firm objectives. In the context of sub-global participation in greenhouse gas mitigation efforts, this paper investigates the effectiveness of a Canada-U.S. emissions bubble under their existing regional trade agreement. It also explores the potential economic impact of carbon tariff harmonization through the implementation of a common Canada-U.S. external border tariff adjustment as a mean to address competitiveness issues. Using a multi-region, multi-sector computable general equilibrium model, the paper finds that the creation of an emission bubble between the two countries could improve efficiency. The findings also suggest that a carbon tariff harmonization policy could give rise to distributional issues among Annex I regions and could fail to mitigate the negative competitiveness impacts of carbon abatement policies. The Hubbert-Deffeyes "peak oil" (HDPO) model predicts that world oil production is about to enter a period of sustained decline. This paper investigates the empirical robustness of this claim. I use out-of-sample methods to test whether the HDPO model is capable of estimating ultimately recoverable reserves. HDPO model estimates of ultimately recoverable reserves, based on data available 30 years or more in the past, are found to be less than current observed cumulative production and discoveries. This result is robust to different specifications of the HDPO model, to applications to production and discoveries data, and to various levels of geographical aggregation. These problems stem from an attempt by the HDPO model to force a linear relationship onto data which are inherently nonlinear. This characteristic of the data is present in a wide variety of natural resources. I also show that the HDPO model is incapable of distinguishing between processes for which cumulative production is truly finite and processes for which cumulative production is unbounded. These findings undermine claims that the HDPO model is capable of yielding meaningful measures of ultimately recoverable reserves or of predicting when world oil production might peak. Following the Kyoto protocol and the European Union climate policies energy plants exceeding 20 MW capacity have been part of the EU's emissions-trading scheme (ETS) since 2005. However, the users of renewable fuels will not pay for tradable carbon allowances. Advanced energy production technologies enable the switch from fossil fuels to renewable wood fuels, and therefore wood fuels may constitute a competitive substitute for fossil fuels, especially if the price of allowances is relatively high. In this context we analyzed plant level Finnish data from years 2005-2008 with mixed models. Econometric equations were specified and estimated for the wood-fossil fuel ratios, and for the fossil fuel cost shares. We found that the EU ETS has short term impacts on the fuel mixes of the energy plants. The elasticity of substitution between fossil and non-fossil fuels is larger under the ETS. Large plants have adjusted their fuel technology choices toward more wood using and fuel price sensitive forms. The size of energy plants and heterogeneity among them across the industries determine the extent of fuel substitution. However plants' regional locations have limited roles in the inter-fuel flexibility. This paper provides evidence on the relevance of modeling adequately the seasonal character of coal and electricity production across Chinese regions. Unlike other work, this paper relaxes the assumption of deterministic seasonality, allowing for time and regional variation in this economy. More specifically, we analyze and distinguish the type of seasonality around the year that prevails in the case of coal and electricity production of each individual Chinese province. Our results indicate that for the majority of the provinces seasonality is stochastic in both types of energy considered. Our findings provide new evidence of a Lunar New-Year effect in February and Summer as well as Winter effects in coal and electricity production. However, in terms of seasonal patterns and their evolution over time, there are significant differences between the Northern Southern regions. Besides for each type of energy, regional clusters matter for the appropriate design of energy-development policy. We study, using a structural vector autoregressive (SVAR) model, the relationship between oil price shocks and the Japanese stock market. We find that oil price shocks that arise from changes in aggregate global demand are positively correlated to returns on the Japanese stock market. Thus, in contrast to the conventional wisdom, a rise in oil price is not always bad news for the Japanese stock market. On the other hand, the Japanese stock market reacts negatively to oil price increases related to oil-market specific demand shocks. Finally, different from prior research using U.S. stock market data, we find that supply and demand shocks in the global crude oil market affect returns to the Japanese stock market index through changes to expected real cash flows rather than to changes to expected returns. 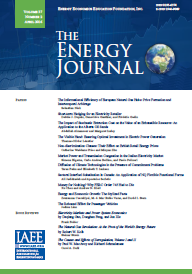 This paper combines two aggregate production function models--one with urbanization as a shift factor and one that includes energy/electricity consumption and physical capital--to estimate the macro-level relationship among urbanization, energy/electricity consumption, and economic growth using a panel method that is robust to both cointegration and cross-sectional dependence. For four panels (comprising in turn high, upper middle, lower middle, and low income countries) GDP per capita, total final energy and electricity consumption per capita, gross fixed capital formation per capita, and urbanization were found to be I(1), cross-sectionally dependent, and cointegrated. The long-run elasticity estimates suggest (i) that urbanization is important to and associated with economic growth, (ii) that urbanization's impact on economic growth ranges from substantially negative to nearly neutral to positive as countries develop--an "urbanization ladder" effect, and (iii) that less developed countries are over-urbanized (their elasticities being negative).